It used be said by one of the Trollopes in the nineteenth century that respectable church-attending visitors would stay in Bagni di Lucca Villa where there’s the ex-Anglican church, now library, described in my previous post, and that the bohemian, gambling and god-unfearing crowd would lodge at Ponte a Serraglio instead. Of course, nothing could be further from the truth today especially since Kety Bastiani’s venture to hold an ever-changing art exhibition in the foyer of the commune’s town hall continues to attract artists of the highest calibre. Certainly, the current one highlights both Ponte and Villa since it consist of work from that doyen of art groups, the Borgo degli Artisti sited at Ponte and under the energetic management of Morena Guarnaschelli, whose works are also on show here. Here are two water colours by Morena in all their delicacy and subtle tonal range. They truly speak for themselves. Maureen Halson shows her almost supernatural gift of plasticity in the modelling of these two gorgeous statues. Jenny McIntosh, part of whose triptych which caused such a stir last year at the Arts festival is on show there, has contributed two haunting portraits. They are almost as if unearthed from an archaeological site like ancient bronzes from a forgotten civilization and reminded me of some of the faces I’d seen at the unforgettable ‘power and pathos’ exhibition earlier this year at the palazzo Strozzi in Florence. Albert Beach, one of the founding father of the Borgo, restored a sense of happiness with his joie-de-vivre colour in two largish landscapes. Sara Massocco evokes an almost Morandi-like atmosphere in her contribution to the foyer. 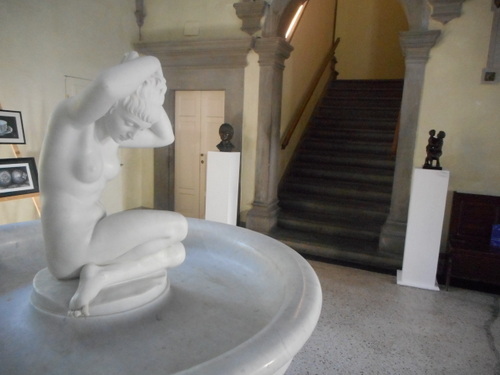 The exhibition is certainly the best thing to have appeared in the town Hall’s foyer ever since the delightful Bagni di Lucca bather statue was moved there. See it now for there’s a new exhibition opening after August 7th! 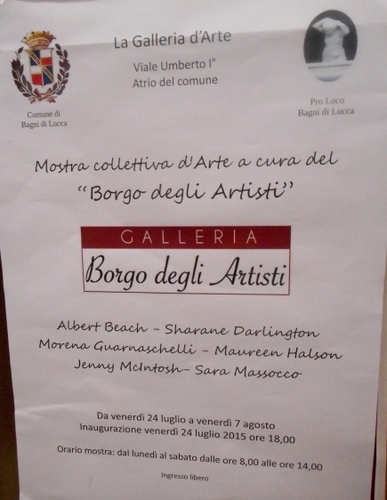 This entry was posted in Art, Arts Festival, Bagni di Lucca, Event, Exhibition, Sculpture by Francis. Bookmark the permalink.